Two interlinked databases: one for herbs and the other for nutrients. Instantly rearrange and redisplay data in ways useful for prescribing, reference and learning  a process that using any other (even computerized!) method would be both laborious and prohibitively time-consuming. See below for examples. TMD makes it as easy as it can be to keep abreast of the latest information and to have it immediately available in whatever format you choose. So, TMD provides you with the tools to build your own fully expandable Materia Medica database for herbs and nutrients from your preferred sources, and update it easily at your convenience. Then instantly re-organise and display your data in any way to meet your current needs. So, TMD provides you with the tools to build your own fully expandable Materia Medica database for herbs and nutrients from your preferred sources, and update it easily at your convenience. Then instantly re-organise and display your data in any way to meet your current needs. Then instantly re-organise and display your data in any way to meet your current needs. TMD delivers the ultimate in control and flexibility in data entry. you control the sources from which you build your database. 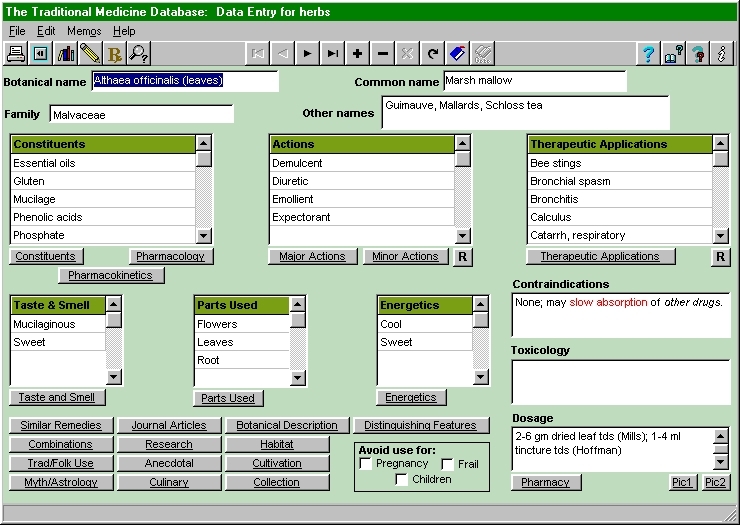 when you've entered data for a herb or nutrient, a single button-click will copy all the information to a new record: all you have to do is provide the name of the new herb (or nutrient) and then make any necessary modifications. A great time-saver when entering data on related herbs and nutrients! Download a fully-functional, 30-day FREE trial version today! Lets you enter abbreviated data on the qualities of herbs and nutrients in a way that is both extremely fast and also convenient for quick-and-easy reference. The use of lookup lists makes data entry both fast and dramatically reduces the possibility of typing errors. Just press the Insert key whilst in one of TMDs data grids and then enter the first two or three characters of the entry you wish to make: the lookup list appears, and youve a 90% chance that the item youre looking for is already highlighted! Having found the lookup item, just press Enter and the entry is pasted into the grid. While the number of items already existing in lookup lists varies widely, a few (such as that associated with the 'Therapeutic Applications' grid) contain literally hundreds. Click on the thumbnail below to view a full-sized picture of one of TMD's grids with its lookup list activated. If the item is not in the lookup list, finish typing it and press Enter: TMD will capitalize the first letter if you havent already done so and then not only add it to the records in the grid, but to the lookup list as well! If you make a typing error whilst entering a lookup list item, you can correct it using TMDs Setup and Maintenance form. Having done so, TMD will offer to automatically search all your grids and replace any incorrect entries! this information will then be immediately available when viewing the Prescribing Information form. The Food Sources, Absorption Locations, Absorption Enhancers and Forms of Availability of nutrients can be ranked in the same way: great for instantly finding the best herb or nutrient for the job in hand! OLE-enabled: if you have relevant data in other applications, create links to them so that when your data changes in TMD, so does the data in those other applications (and/or vice-versa)! Activated just by double-clicking a multi-line field or by single-clicking one of the form's buttons. Click on the thumbnail below to see a full-sized picture of the TMD Rich Text Editor. Data entry in TMD is fast, flexible and powerful: all the features you want, without having to understand over-complex menu structures or learn many unnecessary commands! the other shows data for nutrients (with other related grids and memo fields). 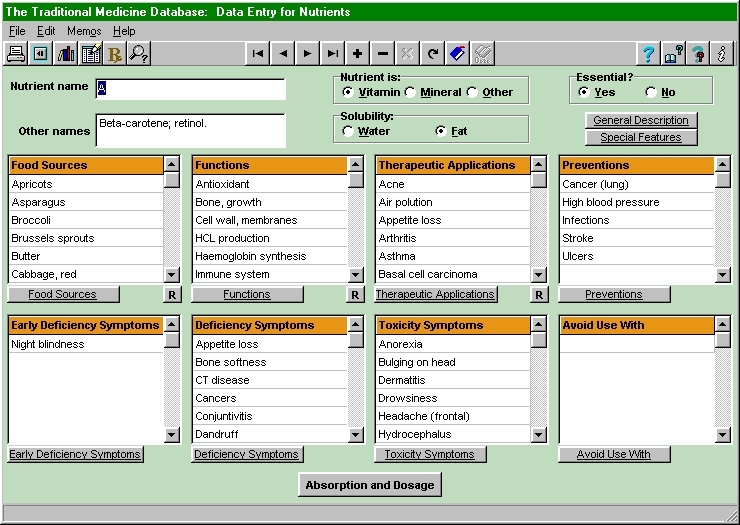 The contents of these grids are controlled by clicking on radio buttons at the top of the form (you can choose from five characteristics of herbs and eight of nutrients, with "therapeutic applications" in common with both, and with the actions of herbs linked to data on the functions of nutrients). view all your primary data on the herb or nutrient with just a couple of button-clicks. What are all the herbs with action Y? What are all the nutrients to be found in food source Z? 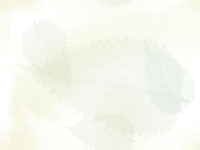 Links information on the actions of herbs with the functions of nutrients. So, whenever you are viewing the therapeutic applications of a herb (or nutrient), you also see the equivalent data for nutrients, without having to do anything at all!! The same applies to the actions of herbs and the functions of nutrients. 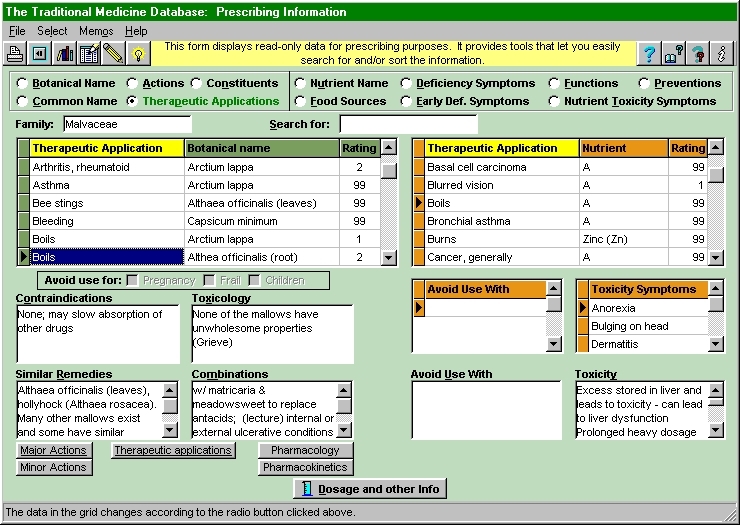 Click on the thumbnail below to view a full-sized picture of the Prescribing Information form displaying linked therapeutic applications data for herbs and nutrients. With TMD, theres simply never been a more simple or convenient way to view the complex relationships between types of data! Easy to learn and use (all program features can be accessed using on-screen buttons or other components such as radio buttons: no need to search through complex menus!). Want more information? E-mail info@dynamicarray.com.au.